Test Drive DuraTex® Roller Grade before buying a whole gallon. OR… it’s just the right size for a smaller project or a recoat. 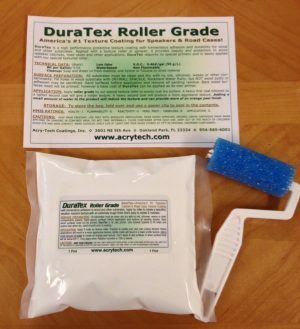 We got creative and found a way to put the DuraTex® in a bag and pack it in a box along with a texture roller so you’ll have everything you need to give us a real good Test Run or to do that rehab you’ve wanted to do without having to buy a whole gallon. The Kit is just right to do 10 to 12 square feet of speaker cabinet surface ~ enough for a couple 18” x 12” x 12” cabinets with two full coats for each cabinet. The price for the Pint Size Kit includes shipping charges within the USA. DuraTex® is a high performance protective texture coating with tremendous adhesion to wood and other substrates. It can be spray applied to create a tough, beautiful, weather resistant and easily maintained texture surface. 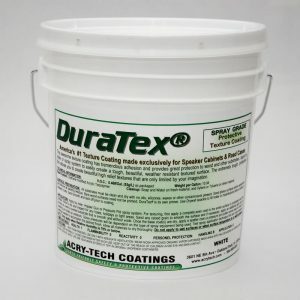 DuraTex® was designed to provide beauty and protection to wood speaker cabinets, road cases and other applications. DuraTex® is a blend of highly technical polymers, and special LOW V.O.C coalescents for creating beautiful high relief spatter textures. 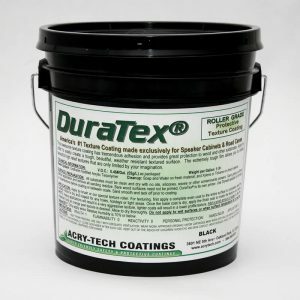 DuraTex® requires no special primers and is easily applied with a brush or textured roller. CUSTOM COLORS ARE ALSO AVAILABLE! CONTACT US FOR DETAILS. All substrates must be clean and dry with no oils, silicones, waxes or other contaminants. 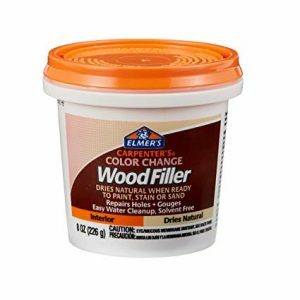 Fill holes in wood substrate with DRYWALL SPACKLE, Bondo, wood filler or similar products or adhesion may be sacrificed. Sand surfaces before application and remove all sanding residue. Bare wood surfaces need not be primed; however a base coat of DuraTex® can be applied as its own primer. By ROLLER: Apply roller grade by brush or roller to evenly coat the surface. A heavy first coat followed by a lighter second coat will give a milder texture. A heavy second coat will produce a more aggressive texture. Adding a small amount of water to the product will reduce the texture profile and can provide more of an orange peel texture. By SPRAY: Apply spray grade by Hopper Gun, Pressure Pot HVLP or airless spray system in a complete even coat to the entire surface to completely seal and protect the surface. Once the base coat is dry, apply a spray texture coat by lowering the air break-up pressure. Spray pressures will be dependent on the type of spray equipment being used. Test the spray application technique first on a piece of cardboard and note pressure settings needed to accomplish the finish desired. Typical pressure pot base coat application uses only 15# of fluid pressure and 30# of air pressure. Texturing uses 20# of fluid pressure and only 5-10# of air pressure. Higher air pressure = smaller dots. Lower air pressure produces larger dots. Higher fluid pressure + Higher air pressure produces a smoother, orange peel surface. Multiple color spatters create a “stone look” finish! Allow all materials to dry thoroughly through air drying or forced drying in a baking oven. Do not exceed temperatures of 150°F for drying. Heating speeds up the curing process of DuraTex® but normal air drying will accomplish the same finished result over time. (Oven heating is optional, but facilitates rapid production throughput.) Do not apply this product to damp surfaces or when surface temperature is or will be below 60°F. and when Relative Humidity is above 70%. To store containers that have been previously opened, spray a fine mist of water onto the coating surface in the container before resealing the lid. This raises humidity levels in the container and can help prevent the product drying or skinning over in the container. KEEP FROM FREEZING. USE ONLY WITH ADEQUATE VENTILATION. WEAR NIOSH APPROVED ORGANIC VAPOR CARTRIDGE MASK WHEN APPLYING OR SANDING IN CONFINED AREA. DO NOT TAKE INTERNALLY. CLOSE CONTAINER AFTER EACH USE. KEEP OUT OF THE REACH OF CHILDREN! AVOID EYE AND SKIN CONTACT. WEAR GOGGLES. SHELF LIFE AT LEAST ONE YEAR WHEN STORED AT 75°F IN ORIGINAL UNOPENED CONTAINERS. Textures created with DuraTex® include Heavy Orange Peel, Medium Orange Peel, Fine Orange Peel, Roller Grade Wild and Roller Grade. This product is amazing as there is not need of primer just one product covers primer as well as final coats giving good strength……..thanks. excellent product. Rolls on just as described for the look that is on the Carvin TRx series. Can’t go wrong for restoring a cabinet. Just be aware that if you have a high-end, well-made, old cabinet like mine (a 10-20 year old PAS subwoofer pair), that the prep on the cabinet itself (pulling carpet, plastering/filling holes, sanding, etc.) can be quite a job if you don’t have any experience or helpful equipment such as shop vacs, electric box sanders. I would recommend a cheap 6" plaster tool and at least a quart of plaster, depending on the cabinet. If you have a cheaper cabinet, such as my Technical Pro 1801 powered sub, the carpet should come off relatively easily in comparison. Advice on the internet for pulling carpet is to set the cabinet in the sun for a few hours (or carefully heat with a heat gun) and it should loosen up the old carpet. If its a tough pull, try a good pair of tongue-and-groove pliers. This product is excellent. Very easy to apply, great appearance and tough! I would recommend to any speaker builder hobbyist or pro. I bought this trial pack to finish a customer’s amp cabinet. He did not want any of the Tolex-style finishes so we settled on this product. I was amazed at how easily it was to develop a great texture. Two coats plus a little touch up and it was done. I used black satin Krylon on the inside of the amp cabinet and it blended perfectly with the black color of the Duratex. That spray paint can also be used to touch up the Duratex itself as it is the exact same shade of black. It’s definitely a winner in my book. © 2019 Acry-tech Coatings, Inc. All Rights Reserved.